I am breaking my own rule by using a punny title, because so often a pun takes away the dignity of a piece, but this one fits. We humans have our necessities: food, shelter, clothing, and, for some of us, art. Recently CNBC aired a program called “Ripping Off the Rich.” Among other things it highlighted how art is so tempting to thieves because of its compact value: one man walked into a museum with a shopping bag and walked out with a $200,000 Picasso pencil sketch, Tête de Femme. The sketch’s owner, Rowland Weinstein, was quoted as saying “My goal is to keep this kind of work accessible to the public, and there’s always a risk to that.” Thankfully the sketch was later safely recovered. To combat the ever-growing art theft problem the FBI opened its own art theft department in 2004, and you can read about it here:http://www.fbi.gov/about-us/investigate/vc_majorthefts/arttheft/arttheft?vm=r. Displayed art is vulnerable, yet I am a firm believer that no individual should own world-class art. (What constitutes world-class art is worthy of its own discussion and is certainly based on individual taste.) If I could afford, say, a Van Gogh, I would immediately have it copied and send the original to The Art Institute, no matter how much I adore Vincent. Art should be shared, not hoarded. But unfortunately this same impulse also makes art vulnerable. 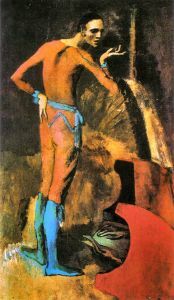 A case in point: a couple of years ago a woman fell into Picasso’s “The Actor” and ripped it. 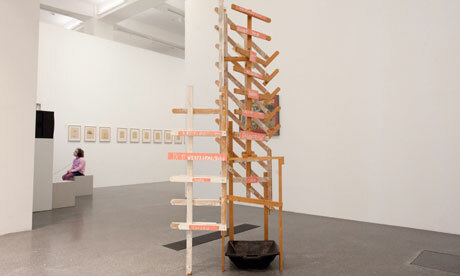 In 2011 A cleaning woman ruined Martin Kippenberger’s “When It Starts Dripping from the Ceiling” by “cleaning” the thin layer of paint from the pail’s bottom. I once heard a tale (I shuddered!) of a man and his friend who were at an art museum and the friend pried a fleck of paint off of a masterpiece. The man, his friend, and the artist will remain anonymous. Such horror stories are not as rare as we would like. This doesn’t even speak to the horrors of fire or water damage. Add to that the intentional stealing of art, and we are dealing with a vulnerable form indeed. What to do? I’m not sure what the answer is, but I know we must risk losses. Art is vital to our wellbeing. Or at least it is to mine, anyway. Below is the FBI’s top ten art crimes list. Here’s hoping all items are quickly reported as recovered, and soon.